These Mighty Bright Ultrathin Lights are great for reading by. 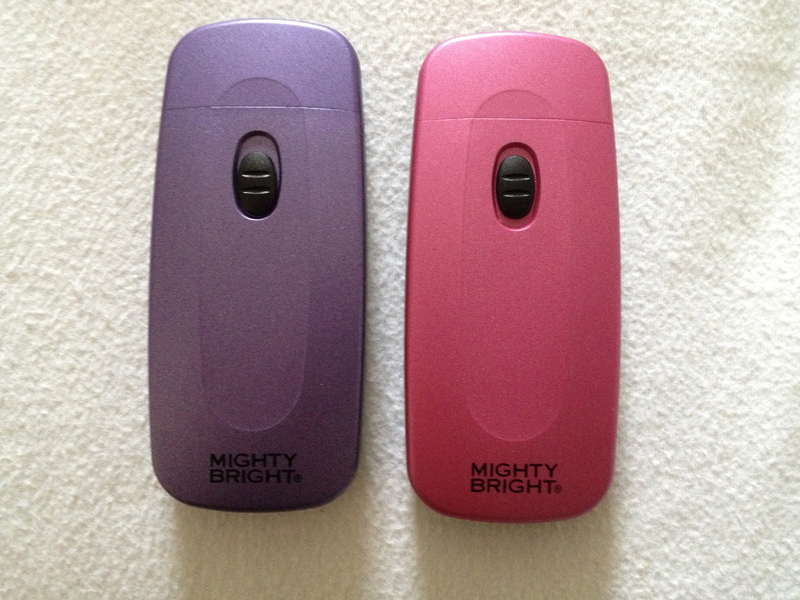 They’re small, come in fun colours, can double up as an emergency torch and my children – who share a room – love them because they can stay up in bed reading (or looking at the pictures) without disturbing the other child if one is ready for sleep and the other isn’t. 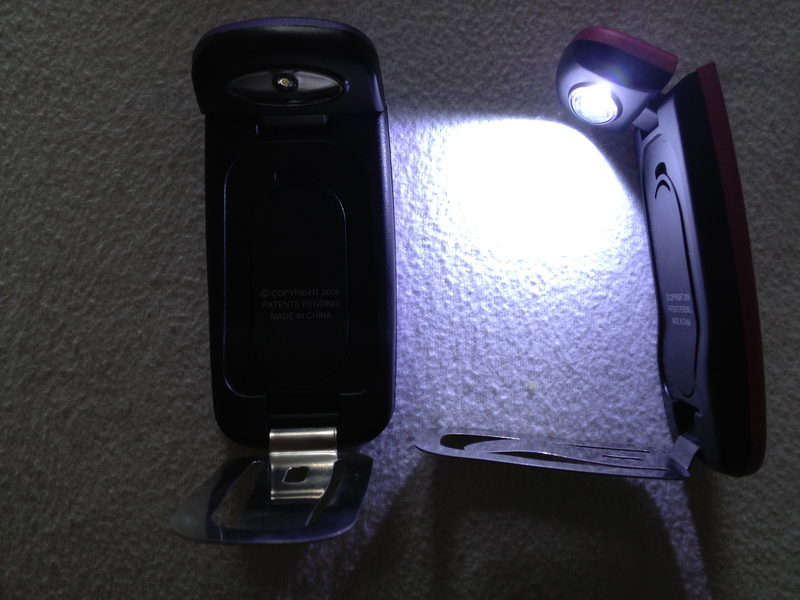 The lights fold flat and are really light and small (think tiny mobile phone size) but have a hinge to clip onto your book cover and a poseable light. They cost about £9/£10 each. I got mine from the dreaded Amazon. This entry was posted in Consumer and tagged bedtime, book lights, books, reading on June 28, 2013 by Annalisa Barbieri. This is the special bit between handing in a big piece and waiting to hear if you have to make huge changes with less than three hours until it has to go to press. Or, if the whole thing will pass smoothly by, slipping into production with just a few waves of tweaking by me. And as such, there is very little I can do right now but wait, and listen to the birdsong in my garden and wonder when the sun will appear from behind the thick kapok of cloud. This part of writing is like the period between O and A’levels, such as they were in my day. I’d done my O’levels, I was waiting for my results, but my A’levels hadn’t started yet so there wasn’t anything else I should be doing but lie, tummy down, on the big window sill at home and stare up the road dreaming of what my future would look like. So I’m going to do a gentle post today, whilst I sit and wait. And it’s about over proving. Here are two pictures of the same loaf. I left it out of the fridge, by accident, so it had a 14hr prove at about 20degrees. I note in Paul Hollywood’s book How to Bake, he tells you to leave the sourdough out for what sounds like too long – something like 22hrs – at a warm room temperature, with the dough wrapped in plastic. But his method is all different to the Dan Lepard one I use anyway (has anyone used the Hollywood method for making sourdough? Be keen to hear how it went, I just can’t fathom how the bread wouldn’t over prove, being out for so long). The first picture was the first slice. I feared the loaf had been over proved, but it looked okay at first. Great even (the taste was good), and I thought I’d caught it all in time. 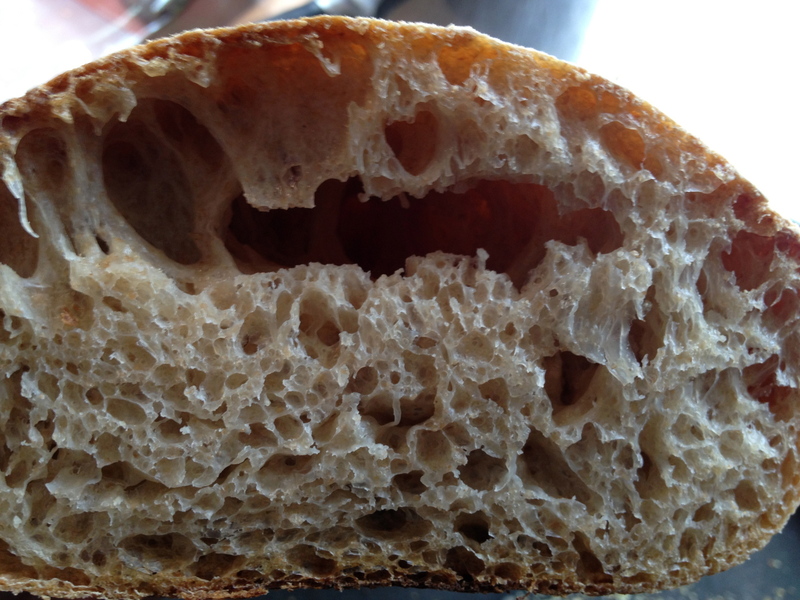 But look further into the loaf, at the second picture and you’ll see that great cave of air at the top, which is a sign of a sourdough that has been over proved. See the difference? It had good airholes, but nothing like the ones in the first picture. 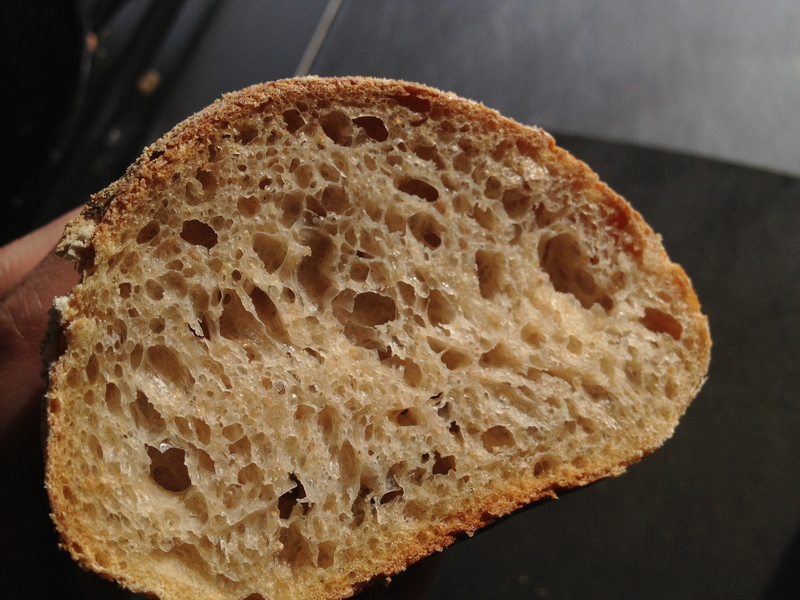 I’ve discovered the really perfect way, for me, to make sourdough is to put it in the fridge for a period of time, so the flavour can develop without the dough exhausting itself, and then taking it out for a good few hours so the crumb can develop large air holes. But it takes planning and time. 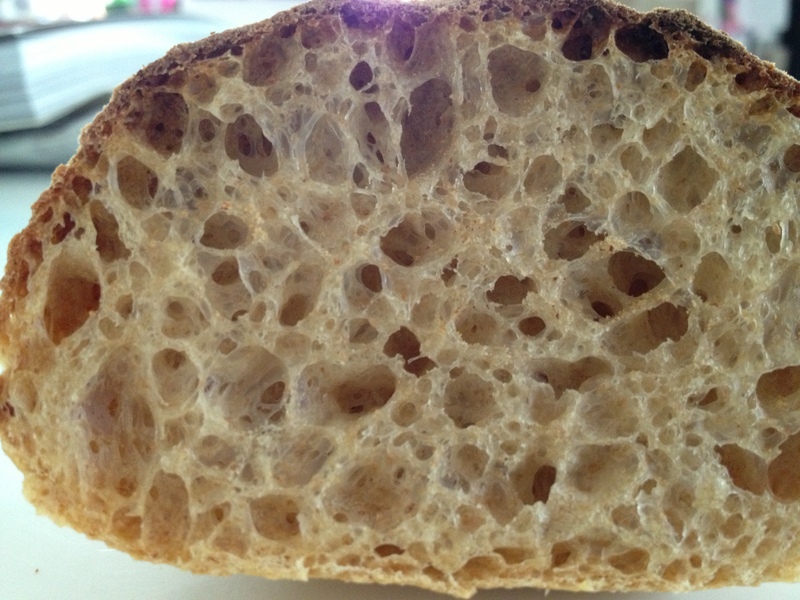 This entry was posted in Bread, Sourdough and tagged dough, overproving, retardation, sourdough on June 19, 2013 by Annalisa Barbieri. This recipe originally comes from a marvellous book called Salads by Peter Gordon. I first made it about two years ago and my mouth fell open in wonder when I tasted it, which was handy as I could fork more of it in. I’ve changed it, the proportions, but also the tomatoes. Gordon originally asked for cherry tomatoes that you cook in olive oil on a high heat for a few minutes, until the skins burst, then cool them. But I use Hugh Fearnley Whittingstall’s honey roasted cherry tomatoes in this. You can play around with quantities, and to a certain extent ingredients (you can leave the chilli out, I do frequently so my children will eat it). It’s far and away the best ‘tricolore’ (tre colori in Italian) I’ve ever eaten. If you can’t be bothered to honey roast the cherry tomatoes first, and I’ll admit is is a faff, then just do them PG’s way. But you’d be missing a trick. 1 quantity of honey roasted cherry tomatoes, which you can of course have made the day before (but bring up to room temperature, please). Enough for how many of you there are eating. A packet of really good corn chips. I use Kettle Chips plain ones. Don’t kid yourself, you’ll eat them all. 250g mozzarella, you need the one in the liquid, not the harder block. Obviously more if you’re feeling really hungry but this is surprisingly filling due to the good fats in it. 1 tablespoon of avocado oil. Now avocado oil is expensive and not entirely necessary but it makes a lovely salad dressing so it won’t go to waste. Use extra virgin olive oil if you haven’t got the avocado oil. Either make the tomatoes on the day you eat this, or the day before and fridge them. But either way you want the tomatoes to be at room temperature when you eat them. Put the shredded basil leaves in a jar or glass with half the avocado oil and a big pinch of salt. Shake well and leave it in the sun for ten minutes if possible. Don’t worry if this bit isn’t possible. Make the guacamole by cutting the avocados in half and scopping out the flesh. Put the other ingredients, and the avo, in a bowl and mash together. Taste and add seasoning if you think it needs it (it will probably need a bit of salt). Then all you do is plate it up. A dollop of the tomatoes, tear up the mozzarella, spoon the guacamole on the plate. Drizzle the dressing over it and place corn chips around the side. If you don’t mew and coo when eating this something had gone wrong. This entry was posted in Salads, What's for lunch? and tagged avocados, corn chips, tomatos, tre colori on June 5, 2013 by Annalisa Barbieri.